Matthew is performing in the family concerts on Saturday 29th September with Dominic Harlan and Rebecca Sharp. He is a truly remarkable musician, fizzing with energy and communication, and equally brilliant as cellist, singer and actor. Not only that, he is artistic director of a festival in Kent which has pledged to engage with every schoolchild in the region. What inspiring, unstoppable ambition! Something we are aspiring to at Roman RIver. Meanwhile here is his regular biography. 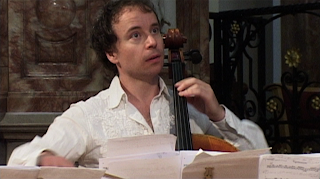 Matthew Sharp has performed at major venues and festivals worldwide as solo cellist, bass-baritone and actor. He has appeared with the RPO, LPO, RLPO, CBSO, EUCO, Manchester Camerata and Ural Philharmonic, performed principal roles for ROH2 (Exposure, Pleasure's Progress), Opera North (Papageno, Pied Piper), Almeida Opera (The Silent Twins) and the Young Vic (Wolf and Hero), given solo performances at the Glastonbury and Latitude festivals, recorded for Sony, Naxos and Avie, given over fifty world premieres and appeared in recital as cellist and singer at Wigmore Hall, SBC and Salle Gaveau. Last year, for Opera North alone, he wrote and directed A Ghost Story for Christmas, performed the Bach Suites at Light Night Festival, sang in The Lost Chord and conceived their 'Four Seasons' collaboration with the Yorkshire Sculpture Park, now a sell-out series in its second season. As writer, composer and performer, he collaborates regularly with leading artists from film, theatre and dance. Matthew is the artistic director of the Deal Festival of Music and the Arts.